Your stress response is designed to instantly accommodate changes in your environment and inside your body. It has to be sensitive to these changes and able to respond quickly but keep these responses in check so homeostasis is preserved. To do this, the hypothalamic-pituitary-adrenal (HPA) axis works as a negative feedback loop. For example, in response to a stressor, the hypothalamus activates the fight or flight stress by causing the adrenals to produce adrenalin and cortisol. 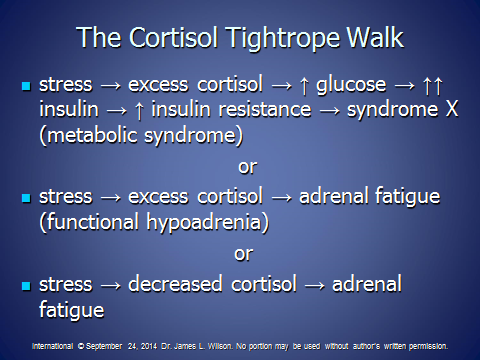 The rising levels of adrenalin and cortisol in turn signal the hypothalamus to stop activating the stress response. However, chronic stress keeps stimulating production of cortisol and adrenalin – leaving your stress response system constantly on. This eventually desensitizes the HPA axis to the negative feedback telling it to turn off, and/or diminishes the ability of the HPA axis glands, especially the adrenal glands, to make adequate amounts of hormones. 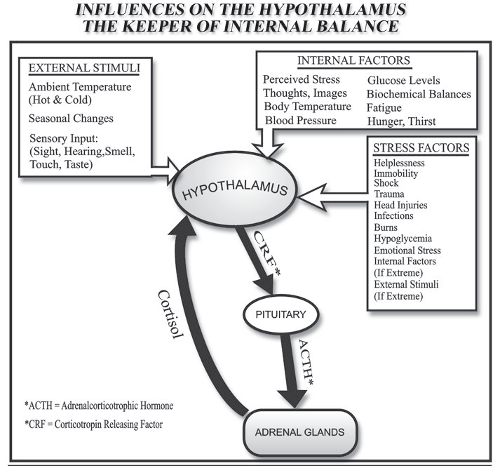 The resulting dysfunction leads to problems related to stress response imbalance. What can you do to promote HPA axis balance? Deep breathing – Even 3 minutes of conscious breathing (inhaling all the way into your belly counting slowly to 5, exhaling completely counting slowly to 5) several times a day helps shift you out of being stuck in high gear. Adaptogenic herbs – Certain herbs can help modulate hormone and neurotransmitter receptor sensitivity in the stress response system, enhancing its feedback loop function so it’s more responsive to on and off signals. Reduce inflammation – Stress itself increases inflammation and chronic inflammation is a constant stressor that keeps your stress response turned on. Reduce stress (see other sections on this page). Increase omega-3 fats (found in salmon, tuna, flaxseeds, walnuts, canola and olive oils). Avoid trans fats (hydrogenated and partially hydrogenated fat). Herbs like turmeric and deeply colored vegetables have anti-inflammatory properties. Bromelain, a protein digesting enzyme from pineapple has anti-inflammatory properties. Avoid pro-inflammatory foods like sugar, white flour, alcohol and any foods you are sensitive to (gluten and dairy are two of the most common but it is individual). Exercise – Since your fight or flight stress response prepares your body for physical action, regular moderate exercise in the afternoon or morning can help your body reset to normal. Sleep – It takes 7 or more hours a night of sleep to give your body a break from an overstimulated stress response and a proper chance to normalize and repair. Stress interrupts healthy sleep and lack of sleep causes stress. Physiological factors like elevated or low stress hormones, psychological factors like anxious thoughts, and behavioral factors like working late on the computer can be the culprits making it hard to get to sleep, waking you up in the night and/or disrupting deep sleep, when your body repairs and recharges. It’s a vicious cycle – but because it’s a closely interrelated cycle, making any one of these factors more sleep friendly, helps shift all of them in the right direction. Everyone is different so make the changes you find easiest first. What can you do to become more sleep friendly? Activate parasympathetic (“rest and digest”) nervous system in the evening by doing something relaxing/non-stressful in the several hours before bedtime. Work with your circadian rhythm, which is regulated biologically but also by external cues. Having a routine in which you eat and sleep at regular times each day, sleep in the dark and get daily exposure to natural light (full spectrum light if natural is not available) helps your biological clock optimally regulate your body’s daily rhythm and cycles, including your sleep cycle. Avoid beverages an hour before bed and go to the bathroom right before bed. Keep your bedroom cool (68°F/20°C or below). Melatonin is the hormone that makes you drowsy at night. Light interferes with its release so avoid hours of bright light (TV, computer, etc.) an hour before bedtime and sleep in the dark. Mindfulness practice in which you spend 10-15 minutes each evening simply watching your thoughts pass through your mind without getting caught up in them helps relieve anxiety and can break a pattern of obsessive worry or emotional triggers. Imagine you are standing by train tracks and your thoughts are a train that you just watch passing by without boarding any of the cars. Meditation or prayer practiced regularly in the evening can shift your focus away from yourself, your problems and feelings of overwhelm to a sense of being part of something larger and feelings of connection and peace. Laughter at any time is good for your body and mind but it also helps you relax (parasympathetic nervous system response) in the evening and helps you shift away from negative thoughts and feelings. Bedtime ritual, whether it’s a warm bath or drink, spiritual practice, or planning the next day, can help you settle down for the night and signals your body that it’s time for sleep. Be in bed before 11 pm (before 9:30 if you have adrenal fatigue). Don’t work on computer, watch TV or be in bright light for at least an hour before bed. Don’t work, argue, eat or watch TV in bed at night. Avoid eating for several hours before bed unless you have low blood sugar.